Oboz Sawtooth II Low Hiking Shoes are ventilated, non-waterproof shoes for hikers and backpackers who want shoes that are lighter weight and less constricting than hiking boots, but are more stable and protective than trail running shoes. 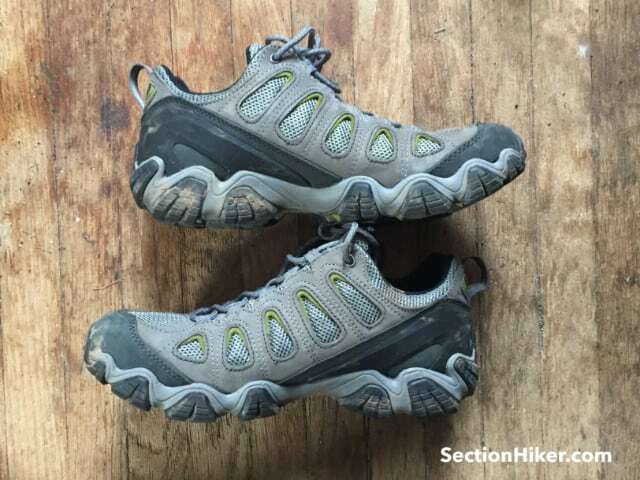 While they look similar to Merrell Moab 2 Low Vent Hiking Shoes and KEEN Targhee III Low Hiking Shoes, they provide much better arch support and a stiffer feel, without compromising on front toe space or comfort. The Sawtooth II Low is also available in the wide sizes required by a third of hikers. I got turned onto Oboz hiking footwear this past winter, when I tried the Oboz Bridger 10″ BDry Winter Hiking Boots (see review), which is a very warm 400 gram insulated boot that shares many of Sawtooth’s II characteristics, including a deep lugged sole and sturdy heel counter that helps lock your heel in place and can help prevent plantar fasciitis. The Sawtooth II Lows are hiking shoes however, so far less warm and bulky than insulated winter boots. They’re still quite supportive in the heels and cup them to help prevent blisters and the pronation (rolling inward of the heel) that can lead to heel pain. The Sawtooth II Low Hiking Shoe has a angled heel counter that helps lock your heel in place while aggressive side lugs provide a robust bumper against side impacts. The protection around the outside of the shoes is excellent for hiking in rocky terrain. A beefy toe cap protects your tootsies, while over-size side lugs provide lateral protection and traction. While the leather uppers give the shoe some structure, they also help shield against side impacts during rock scrambling and off trail. While the Sawtooth II Low’s have mesh sides, the inside of the shoe is lined to reduce friction and help eliminate blisters. This also prevents dust and sand from penetrating into the interior of the shoe and making your socks dirty, while still allowing sweat and moisture to evaporate through the external mesh. The interior lining also provides a surprising amount of insulation in cooler weather, making the shoes good for cold days in spring and autumn when the trails are covered in snow, ice, or mud. Oboz makes a lot of hay about the “O Fit Insoles” that they include in their boots and shoes. They’re actually pretty good and provide more arch support and heel cup support than the crappy insoles most hiking shoe and boot manufacturers include. They’re quite similar to Superfeet’s Carbon insoles (thin insoles designed for low volume trail runners) in terms of arch support and durability, but provide significantly less support and durability than Superfeet’s Green insoles (designed for hiking boots). If you use Superfeet Carbon insoles today, you can probably stop buying them if you use the SawTooth II’s, a saving of $55, which is quite a perk. On the flip side, the SawTooth II Low’s have enough internal volume to fit a Superfeet Green insole, which is a big plus if you need to use them for arch and heel support. The Sawtooth II Low’s run true to size in terms of fit and are available for both men and women, in regular and wide sizes. The O Fit Insoles ($30) are also available for sale separately, which is useful if you need to replace them or want to try them in other shoes you own. 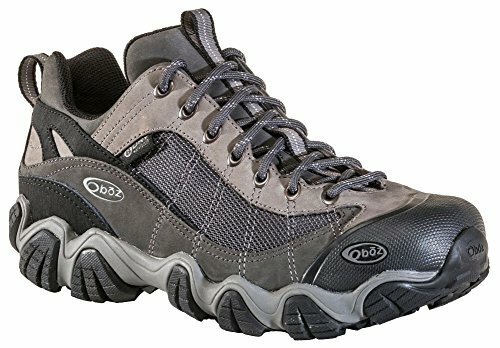 Oboz’s Sawtooth II Low Hiking Shoes are comfortable and stable low hikers for people looking for a supportive yet lightweight hiking shoe that provides plenty of toe box room and protection. Available in regular and wide sizes for both men and women, these ventilated, non-waterproof hiking shoes come with an innovative insole (also sold separately) that compares favorably to Superfeet’s Carbon insoles. An aggressive contoured sole and deep lugs provide excellent traction in mud and run, while leather uppers provide excellent durability and value. Oboz gave the author a pair of shoes for this review. Editor’s note: Help support this site by making your next gear purchase through one of the links above. 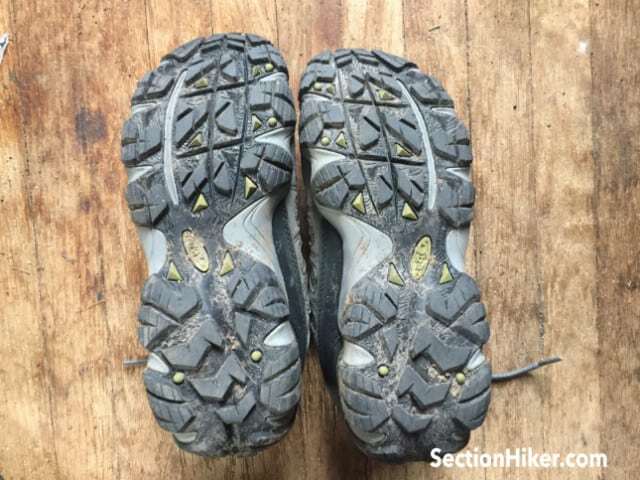 Click a link, buy what you need, and the seller will contribute a portion of the purchase price to support SectionHiker’s unsponsored gear reviews, articles, and hiking guides. 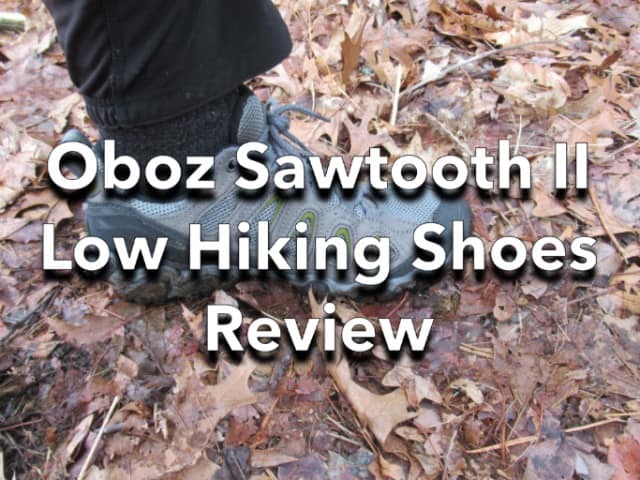 The post Oboz Sawtooth II Low Hiking Shoes Review appeared first on Section Hikers Backpacking Blog.